MOST CRITICS do not think that Orange music is worthy of any serious consideration. Certainly, to admit to enjoying it invites a chorus of disapproval and sneers from the so-called intelligentsia. Malachi O'Doherty, a Belfast journalist, recently described an example of this attitude at a concert in the Linenhall Library. This was billed as music from all 'Irish traditions'. A stirring piece on the uileann pipes was heard in total silence,' In contrast, at the appearance of a woman singing a medley of Orange folk songs, the audience began to talk loudly among themselves and behave as if she wasn't there at all. Their actions belied the lip service given about paying equal respect to all musical traditions. Nevertheless, the Orange musical tradition is very much alive in Ulster. There are few areas in Ulster that do not have thriving bands. My own small area of Tiger's Bay in North Belfast has no less than three bands - Tiger's Bay First Flute, the Blue Star Accordion Band and the famous Onward Flute Band. The Onward band was where James Galway, the internationally known flautist, first learned to play. a local joke has it that the Onward is the biggest band in Ulster as so many people claim to have been in it and to have known 'wee Jimmy Galway'. It is worth pointing out that all these hundreds of bands are entirely self-financing. This is one culture that does not require vast fortunes of taxpayers' money to keep it alive. It is strong and vibrant. Many people think that Orange music consists of The Sash, Derry's Walls and The Green Grassy Slopes of the Boyne and precious little else. Of course there is much more to it than that as these valuable works testify. The Orange Lark is a compilation of forty Orange songs and ballads, most of which were written in the Nineteenth Century. It is the first of several volumes that the Ulster Society plans to collect and publish. Like most folk music, all of human life is in these songs. There is love, tragedy and bereavement, defiance of rulers and enemies, religious steadfastness, humour and most notably the celebrations of past victories. Not unexpectedly, the victory most often celebrated is that of Prince William of Orange at the Battle of the Boyne in 1690. To make the publication more helpful each song is preceded by its musical score. This is where you will find all the words to The Ould Orange Flute, a tale of a flute that remained true to the Protestant religion and was burnt at the stake for its heresy. It is so funny, that the communist republican 'historian' C. Desmond Greaves convinced himself that it was not a genuine Orange song but a Fenian skit. He just couldn't believe that Protestants had a sense of humour! Will still be "No Surrender! " Who freed the British nation. 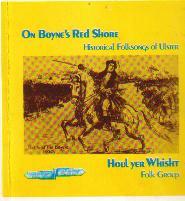 Houl' yer Whist's music album, On Boyne's Red Shore contains five of the songs in The Orange Lark. It opens with the stirring chant, Biddy McDowell to the rhythm of the Lambeg Drum. The title song is not traditional, but is true to the style. It was written by Bobby Hanvey, the lead vocalist of Houl yer Whist. Hanvey gives a moving and realistic picture of what must have been a vicious and bloody battle. Perhaps you like to listen to the music of The Chieftains or Stockton's Wing? I do too. Nevertheless, my heart beats just that wee bit faster when I hear any one of the tunes on this tape. This is 'Ireland's other folk music' tradition, the one that's much less prominent or respectable. No matter how much I disapprove politically of the Orange Institution, this is my music. I want to share it with you. On Boyne's Red Shore can be ordered from record shops quoting the number COAS3005. The Orange Lark is available from Ulster Society Publications, Banbridge Enterprise Centre, Scarva Road, Banbridge, BT32 0BG.